Many partners have come together to support training of Syrian doctors residing in Turkey. The first training took place in November 2014. Twenty-five Syrian doctors are now putting their skills to use providing medical services for fellow refugees in clinics operated by nongovernmental organizations (NGOs) and in refugee camps. WHO is collaborating with Turkey’s Ministry of Health, Yildirim Beyazit University in Ankara, the Provincial Health Directorate of Gaziantep and Gaziantep University in an innovative approach to promote the temporary integration of Syrian refugee health professionals into the Turkish health system to enable them to provide health care to Syrian refugees in camps and urban settings. The first one-week course on primary health care in Turkey took place on 24–29 November 2014 to familiarize Syrian medical doctors, who already provide health care services in camps near the Turkish–Syrian border, with Turkish health services and practices. The course provided an insight into vaccination schedules and the availability of medicines, for example. This project is part of scaling up WHO operations in response to the Syrian crisis in southern Turkey and Turkey’s health sector refugee response plan. The Ministry of Health is developing regulations to allow NGO primary health care clinics to expand in urban areas. These clinics may be served by Syrian health professionals in the near future. The course curriculum is based on basic family practice and primary health care services, modern family practice scientific literature and the Ministry of Health family physician training. It has been developed by faculty members of Gaziantep University. The course includes over 30 lectures and pre- and post-training tests, as well as a list of approximately 200 essential drugs for the main diseases encountered in primary health care. Materials have been translated into Arabic, and generic and common Turkish names for medicines are provided to facilitate prescription. Field visits to a family physician centre are also part of the curriculum. WHO managed the overall organization of the training and has funded all activities related to the Refugee Doctor Adaptation Training, which comprises developing the curriculum, training health professionals and translating materials into Arabic. 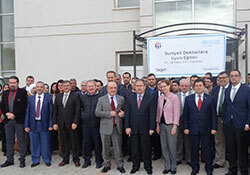 Gaziantep University provided free training facilities and the lecturers were from Yildirim Beyazit University, Ankara, and Gaziantep University.